Here’s the second installment of the 20 ‘lost’ models mentioned a couple of months back (see HERE for the backstory and photos, and HERE for the 1970s models). 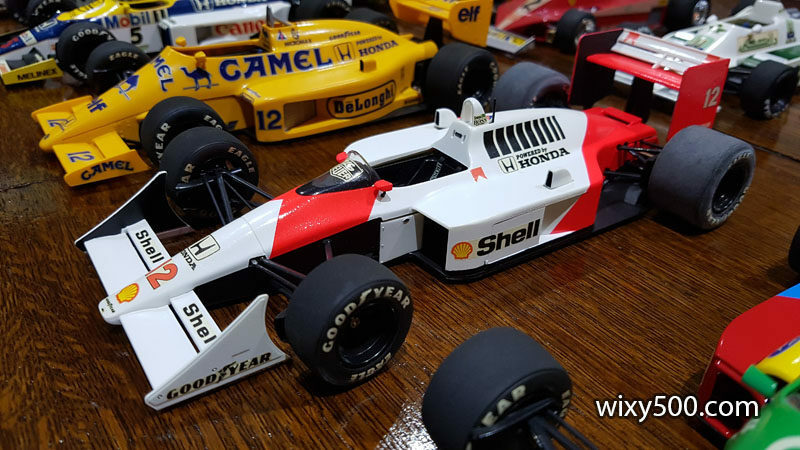 All are Tamiya 1:20 scale Grand Prix series kits, were built between about 1984 and 1997 and don’t reflect the quality of work I can now turn out. 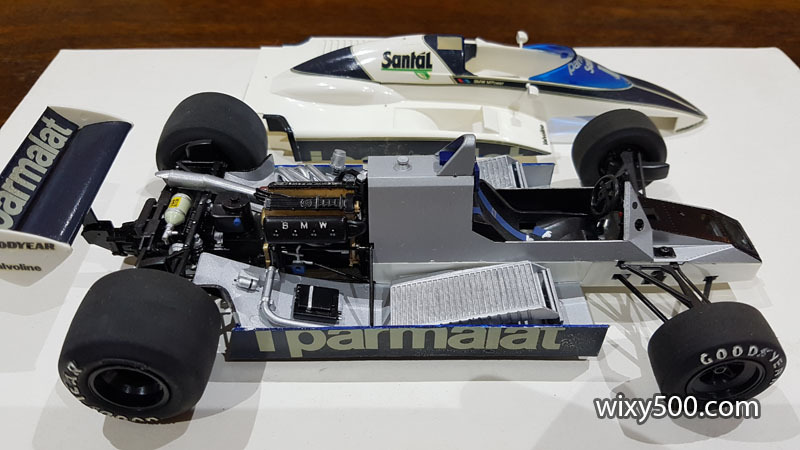 Tamiya 20017 – 1982 Brabham BT50 BMW (built as Nelson Piquet #1). Tamiya’s TS rattle spray cans for the body and chassis were standard for me by this time. From memory, this was a pretty straightforward build. I elected to build the version without the front wings. All the dark blue areas are decal, and the the ones on the sidepods in particular have deteriorated a lot, showing a crazed almost crystalised pattern that looks like they’ve gone flaky. Despite being hand painted, the 4-cylinder BMW turbo engine came up well. I think this was the last model in the range to be manufactured with the tyre lettering molded into the tyre, which then had to be painted by hand. 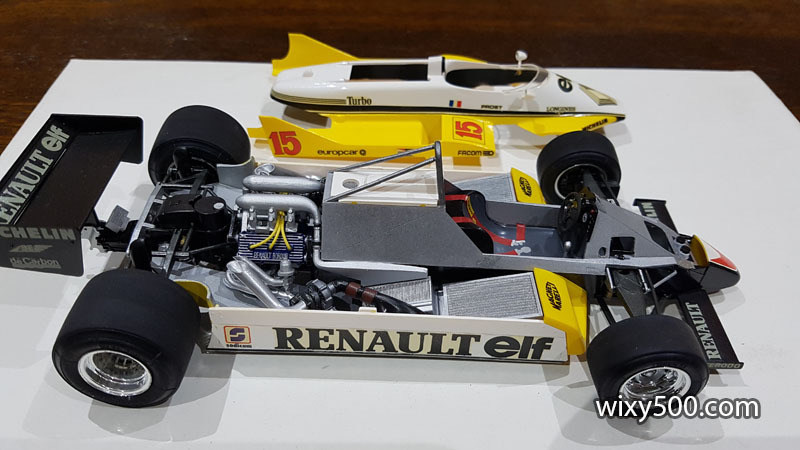 Tamiya 20018 – 1982 Renault RE30B (built as Alain Prost #15). Again, lots of yellowing of the clear decal film. I recall this one also came together pretty easily using TS paint straight from the can for all the white, yellow, semi-gloss black and aluminium areas. I had yet to discover primer which I think could have really helped give the yellow and white some depth. 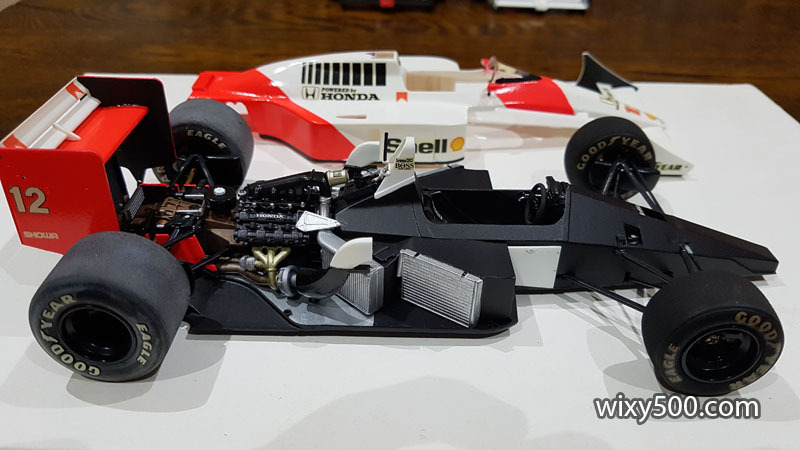 Tamiya 20019 – 1986 Williams FW11 Honda (built as Nigel Mansell #5). This was one of my favourite builds at the time of an iconic race car. Not only were my skills improving, I reckon Tamiya had also upped the ante with accuracy, detail and quality. For example, there was no need to fabricate any seat belts as they were part of the seat and the kit included decals for the shoulder pads; the attachment of the wheels was more positive (including a lug-nut look screw), allowing the kit to be manufactured with realistic levels of camber; the tyre letting was by decal and included branding for the rims. I was still many years off discovering clear coat, so while the paint finish was ok, Tamiya’s decals of the time did not have a high-gloss finish. 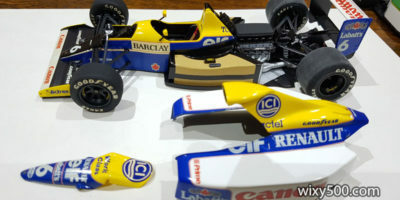 Tamiya 20020 – 1987 Lotus 99T Honda (built as Ayrton Senna #12). Back in the day when the Camel tobacco decals were included in the kit! 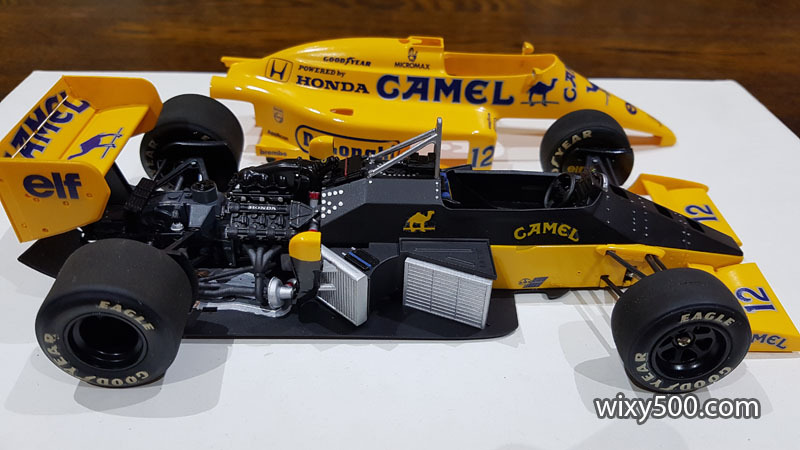 Thankfully, Tamiya produced a special Camel Yellow TS paint for this model. Some argue it’s still not the correct yellow, but it looks ok to me. I couldn’t quite get the nice glossy finish straight from the can like I’d been able on other models. Any yellowing of the decals isn’t noticeable due to the bodycolour, so this model still looks much like it was when new. 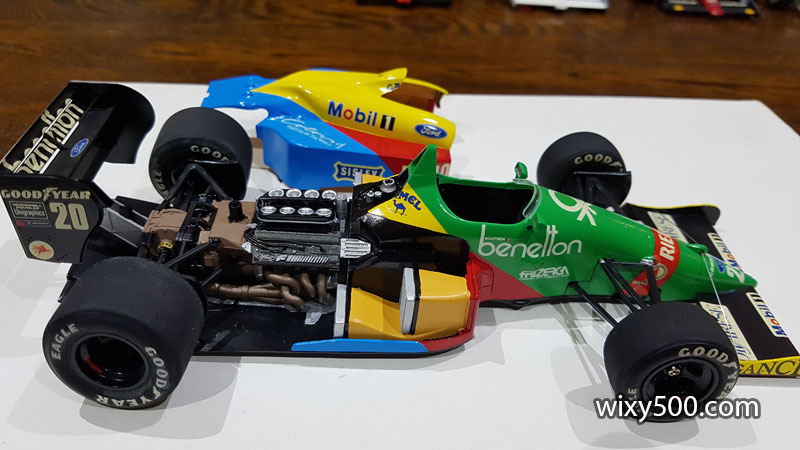 Tamiya 20021 – 1988 Benetton B188 Ford (built as Thierry Boutson #20). All the bodywork is mask and spray – no green, blue, red or yellow decals here. The body parts were molded in green, so I just sprayed the green onto that. However, all the parts to take the other colours were first sprayed TS-26 gloss white. The tan-coloured sidepod ducting and metallic brown gearbox casing were hand mixed (Tamiya acrylic) and hand painted. 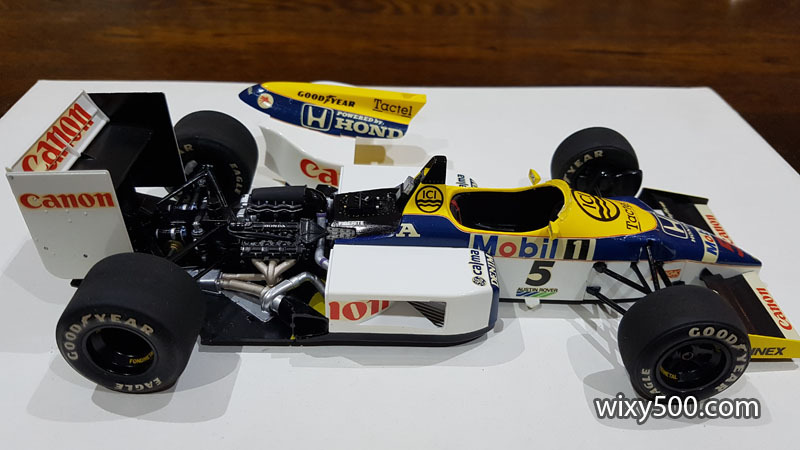 Like the Lotus above and McLaren below, Tamiya used phillips-head screws to attached the wheels, which is a bit of a downer, especially considering the earlier Williams FW11 kit included some really nice wheel-nut shaped screws for this job. 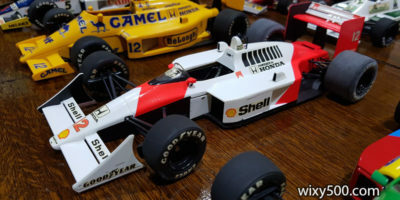 Tamiya 20022 – 1988 McLaren MP4/4 Honda (built as Ayrton Senna #12). For the fluro red, I didn’t use the kit decals; it’s all mask & spray straight from a TS-36 can. The rear tyres have had a grey residue/powder buildup on them over time. Tamiya were now starting to release their kits with no tobacco markings, and this is one of those kits. However, I have another version of this model, an original issue with full Marlboro tobacco markings, including on the box art. Not sure whether to build it up as the Prost version, or sell it off to a collector of such things. 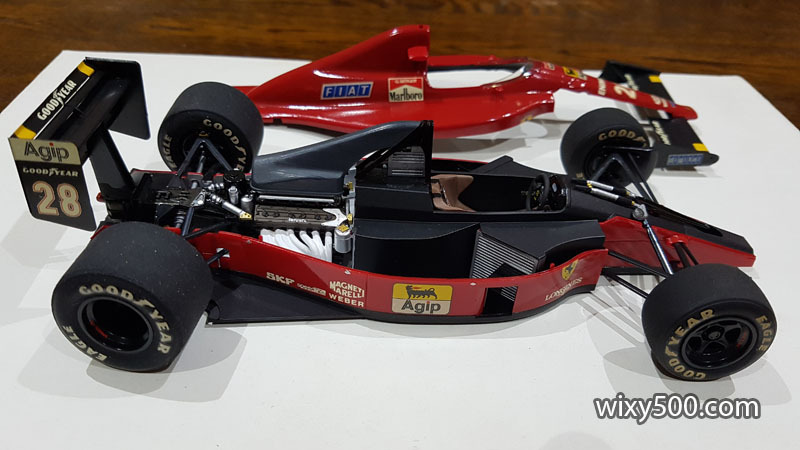 Tamiya 20023 – 1989 Ferrari F189 early version (built as Nigel Mansell #27). The F189 started life with a low airbox that had the air intakes on each side of the rollover bar. Marlboro markings came with both these F189 Ferrari kits. Tamiya spray cans for black and red, as per the instructions. 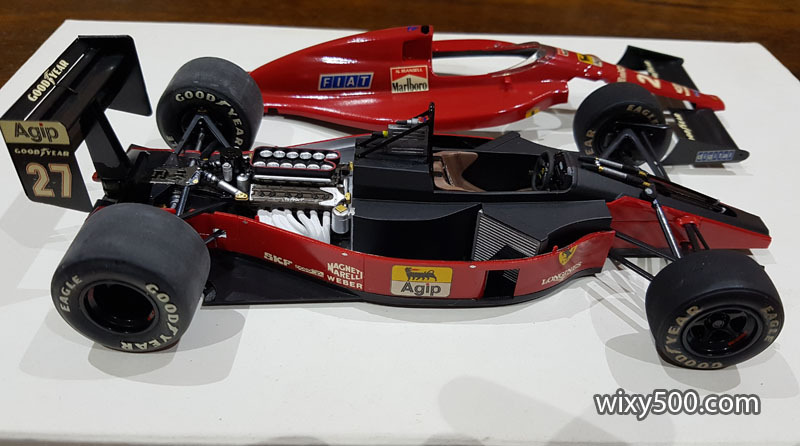 Tamiya 20024 – 1989 Ferrari F189 late version (built as Gerhard Berger #28). Not officially a B-spec version of the F189, this late version had a high airbox, a design aspect that become a standard feature in F1. The two versions are identical except for the roll hoop, engine intake and front wing. Both are standard out-of-box builds.